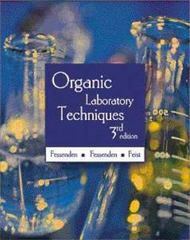 Organic Laboratory Techniques 3 Edition This highly effective and practical manual is designed to be used as a supplementary text for the organic chemistry laboratory course - and with virtually any main text - in which experiments are supplied by the instructor or in which the students work independently. Each technique contains a brief theoretical discussion. Steps used in each technique, along with common problems that might arise. These respected and renowned authors include supplemental or related procedures, suggested experiments, and suggested readings for many of the techniques. Additionally, each chapter ends with a set of study problems that primarily stress the practical aspects of each technique, and microscale techniques are included throughout the text, as appropriate. Additional exercises, reference material, and quizzes are available online.